Collecting encased coins can be a fun and rewarding hobby. What are encased coins? Frequently they are referred to as lucky cents. They are a token which has the coin encased by another material. The first sold as souvenirs at the 1901 Pan American Exposition had an aluminum ring circling the cent. 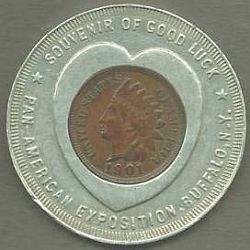 The obverse of the most common encased cent from 1901 Pan AM EXPO has a four leaf clover as the main design. Also known are ones with a bison, a dust pan and a pan shaped stick pin. Most were sold to businesses to give away as advertisement for the business. Car dealers, barber shops, restaurants to name a few frequently bought encased cents as a giveaway. The thought was that the encased cent would be used as a pocket piece and the business name would be "top of the mind" due to the piece being in your pocket. Why collect them. There are many good reasons to collect encased coins. First is that they are inexpensive to collect compared to any silver or gold coin. Most can be purchased for between $5.00 and $10.00. The varieties of encased available to collect are very large. Encased varieties can range from the coin itself, cents to dollar coins, the material of the encasement, from aluminum to steel and beyond and the varieties of the issuer, which range from coin clubs, restaurants, car dealers to banks and insurance companies. Encased coins are tokens. Tokens are collected by state and city, by business type and by date. With encased coins one interesting set would be a date set from 1901 to today. Add in mint mark to the date set and it would be a fun collection. I have seen collections or "irradiated dimes" done by date. The irradiated dime was made at Oak Ridge, TN as a souvenir. You could give them your dime and have it irradiated and then encased and returned. Do to the fact that the coins came from people's pockets the dates are varied. 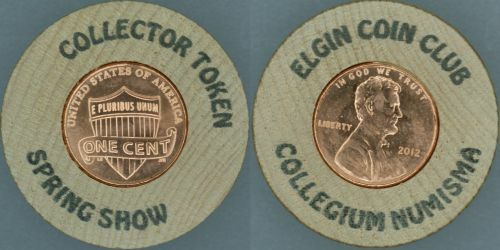 There are collections of encased cents from parks and monuments, from barber shops and restaurants. That is what is fun about collecting encased coins. You may have the finest set of encased coins referring to banks or restaurants. Earl Fankhauser "The Penny Man"
Earl Fankhauser of Ft. Wayne, IN is the best know salesman of encase cents. 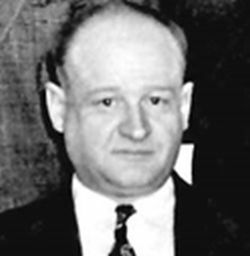 He traveled throughout the Midwest visiting business and selling encased cents. On most of the ones he sold his name appears across the bottom of the reverse in very tiny letters. 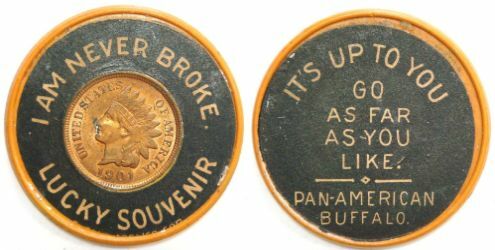 There are collectors of Fankhauser encased cents. 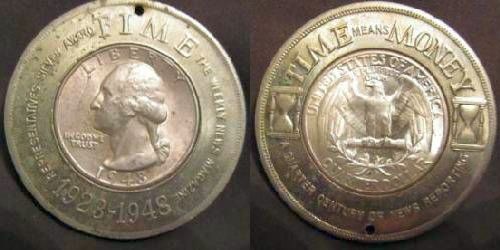 Meads Fine Bread - loaf of bread shaped with encased 1949 cent on obverse. 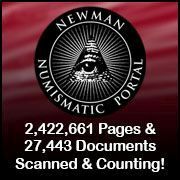 The material that the encasement is made of is an additional way to collect encased. The typical encasement is a round aluminum ring with a cent clenched in place as the design elements are pressed into the encasement. There are plastic encased using traditional shapes for the encasement. With plastic there are hard encasement with the Lick Pier encased half dollars as an example and there are soft plastic horseshoe shaped encased cents. 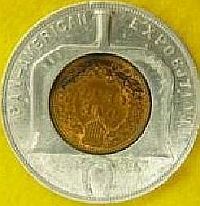 Vulcanite is another material that was used to encase cents for the 1901 Pam Am Expo. Celluloid is used in encased mirrors and encased buttons. There are wooden nickels with a cent encased in the center, at the top of this page is a 1847 large cent encased in stainless steel.